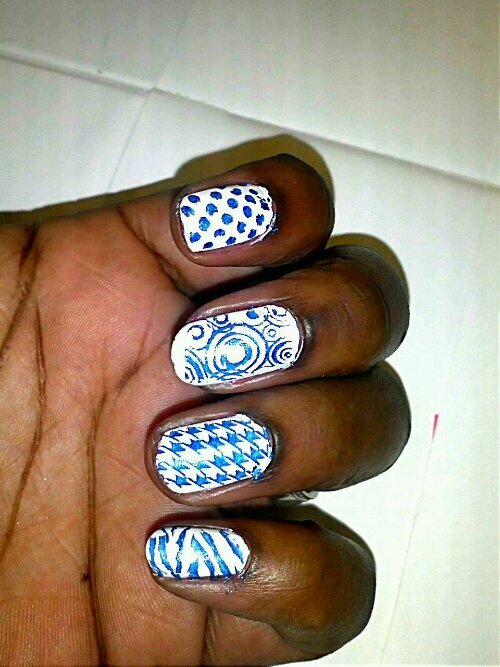 Bundle Monster Plates and Some Nail Art! Okay, so a couple of months ago I purchased a stamping kit from Amazon. I got really excited about being able to Konad. 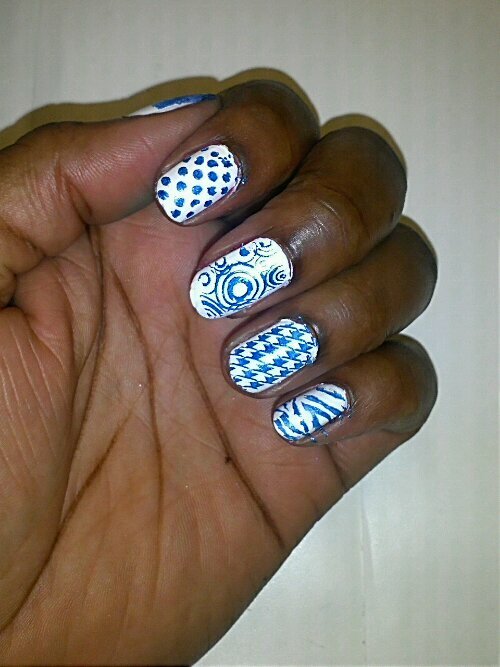 Is it still called konading if you don’t use Konad branded stamping items? I honestly don’t know…. 😦 Anywho, when I received my kit and made my first attempt, I really sucked at it!!!! Lol, I tried over and over and got discouraged and gave up for a bit. Recently, I started trying again, and success! I’m still not an expert or anything, but I’m very proud of the progress I’ve made so far. 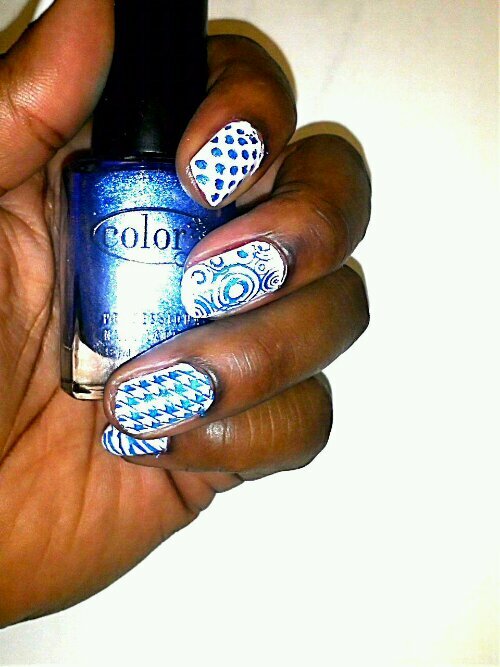 The pics below are using a base shade of Whirlwind White, from Sally Hansen’s Insta-Dri line. 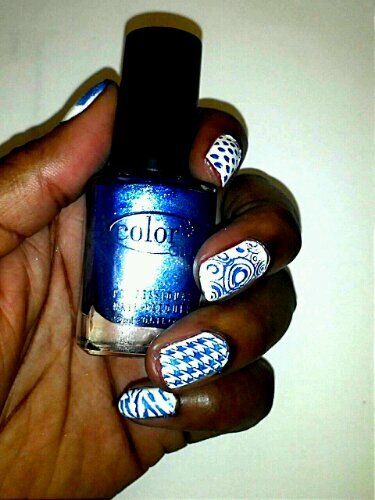 The blue is Cold Metal from Color Club’s Foiled Collection. 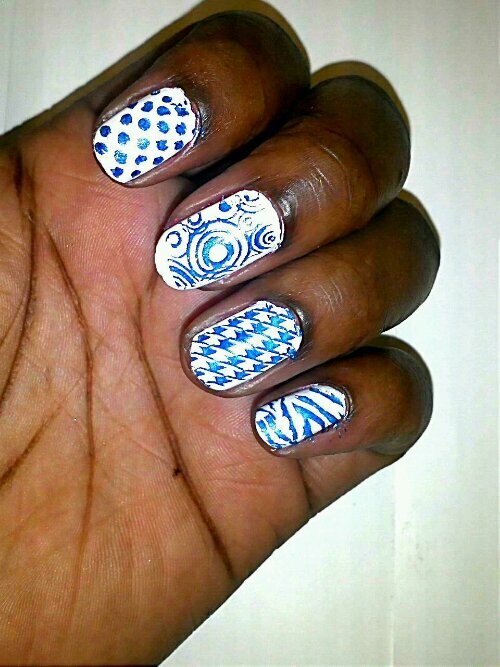 Okay, so on my thumb is an attempt at another type of nail art I’m working on mastering, which is gradients. I’ve seen such pretty ideas, and have all of these gorgeous color combinations I’d like to try! 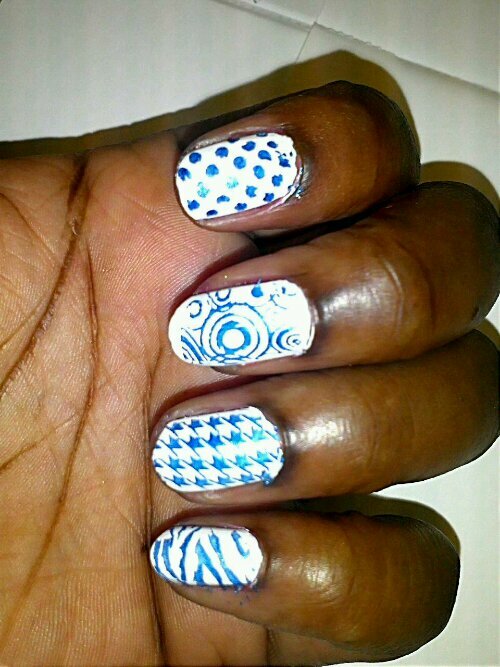 But for right now, lets focus on today’s mani. By the way, I have the whole Foiled Collection, and every single polish is GREAT for stamping! 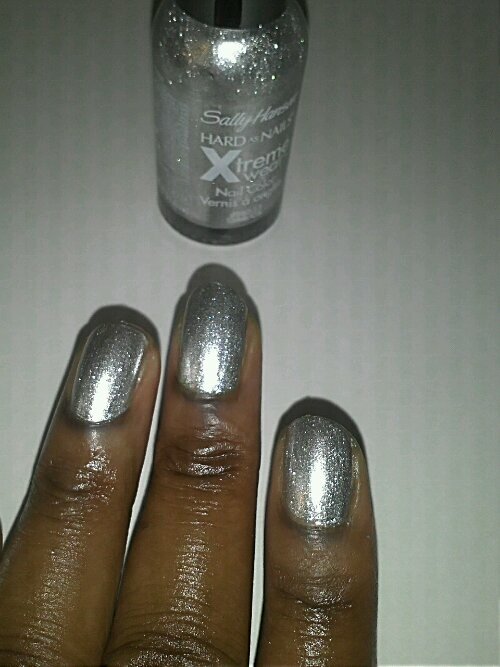 Celeb City is from Sally Hansen’s Xtreme Wear line. 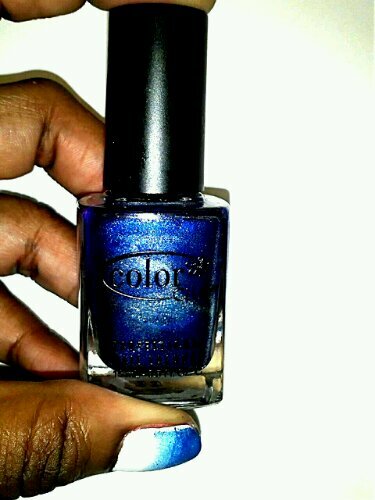 It is a thin polish, with a tendency to flood your cuticles if you aren’t careful, but its such a gorgeous color! 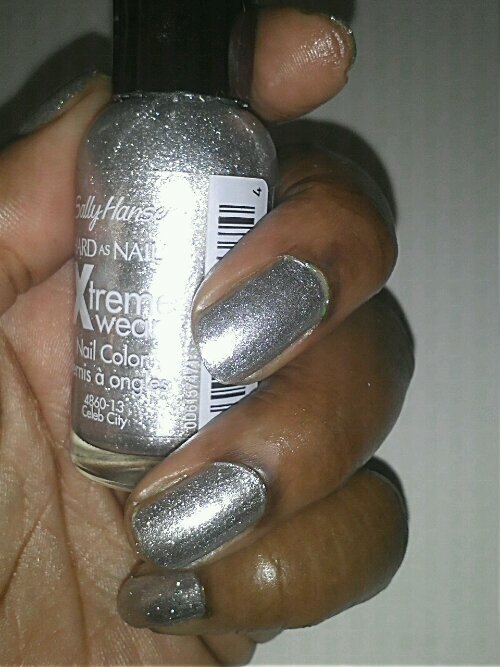 Its not-quite-but-amost chrome-like silver foil, lol. And the shimmer is just awesome. If you are into platinum, silver or white gold jewelry, you are going to want this color. It plays off of your jewelry very nicely. 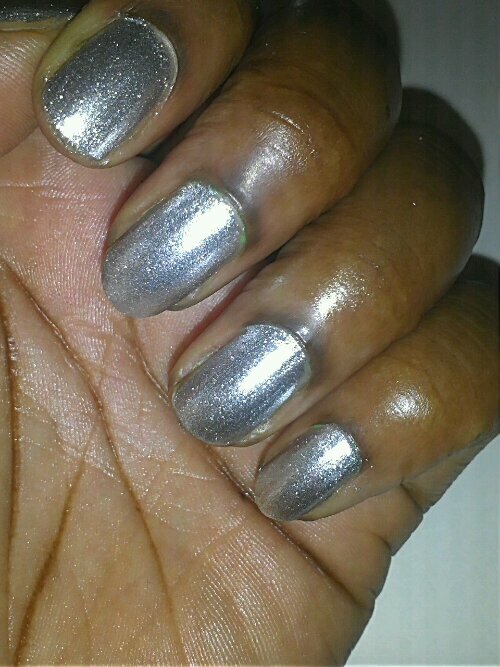 This was two coats without a top coat.